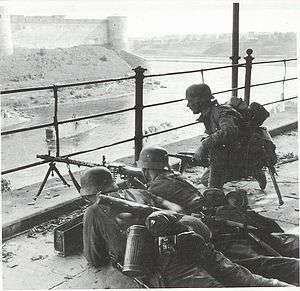 Soldiers defending the Estonian bank of the Narva River, with the fortress of Ivangorod on the opposite side. 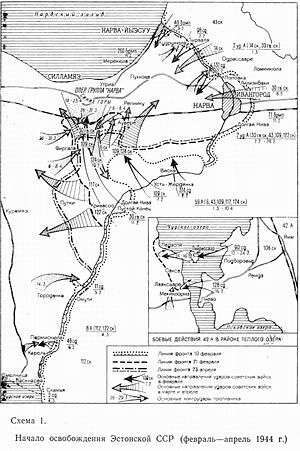 As a continuation of the Leningrad–Novgorod Offensive of January 1944, the Soviet Estonian operation pushed the front westward to the Narva River, aiming to destroy "Narwa" and to thrust deep into Estonia. The Soviet units established a number of bridgeheads on the western bank of the river in February while the Germans maintained a bridgehead on the eastern bank. Subsequent attempts failed to expand their toehold. German counterattacks annihilated the bridgeheads to the north of Narva and reduced the bridgehead south of the town, stabilizing the front until July 1944. 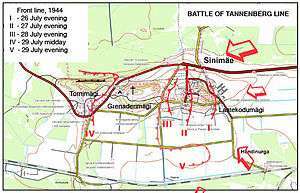 The Soviet Narva Offensive (July 1944) led to the capture of the city forcing the German troops to retreat to their prepared Tannenberg Defence Line in the Sinimäed Hills 16 kilometres from Narva. In the ensuing Battle of Tannenberg Line, the German army group held its ground. Stalin's main strategic goal—a quick recovery of Estonia as a base for air and seaborne attacks against Finland and an invasion of East Prussia—was not achieved. As a result of the tough defence of the German forces the Soviet war effort in the Baltic Sea region was hampered for seven and a half months. 1 2 3 4 5 6 7 8 9 10 11 12 13 14 15 16 17 18 19 20 21 22 23 24 25 26 Toomas Hiio (2006). "Combat in Estonia in 1944". In Toomas Hiio; Meelis Maripuu; Indrek Paavle. Estonia 1940–1945: Reports of the Estonian International Commission for the Investigation of Crimes Against Humanity. Tallinn. pp. 1035–1094. 1 2 3 4 5 6 7 8 9 10 11 12 13 14 Mart Laar (2006). Sinimäed 1944: II maailmasõja lahingud Kirde-Eestis (Sinimäed Hills 1944: Battles of World War II in Northeast Estonia) (in Estonian). Tallinn: Varrak. 1 2 Hannes Walter. "Estonia in World War II". Mississippi: Historical Text Archive. 1 2 F.I.Paulman (1980). "Nachalo osvobozhdeniya Sovetskoy Estoniy". Ot Narvy do Syrve (From Narva to Sõrve) (in Russian). Tallinn: Eesti Raamat. pp. 7–119. 1 2 Doyle, Peter (2013). World War II in Numbers. A & C Black. p. 105. ISBN 9781408188194. 1 2 3 4 5 David M. Glantz (2001). The Soviet-German War 1941–1945: Myths and Realities. Glemson, South Carolina: Strom Thurmond Institute of Government and Public Affairs, Clemson University. 1 2 3 4 5 6 7 8 9 10 11 12 13 14 Laar, Mart (2005). "Battles in Estonia in 1944". Estonia in World War II. Tallinn: Grenader. pp. 32–59. 1 2 Robert Sturdevant (10 February 1944). "Strange Guerilla Army Hampers Nazi Defence of Baltic". Times Daily. Florence, Alabama. 1 2 Евгений Кривошеев; Николай Костин (1984). "I. Sraženie dlinoj v polgoda (Half a year of combat)". Битва за Нарву, февраль-сентябрь 1944 год (The Battle for Narva, February–September 1944) (in Russian). Tallinn: Eesti raamat. pp. 9–87. 1 2 3 4 В.Бешанов (2004). Десять сталинских ударов (Ten Shocks of Stalin). Харвест, Minsk. ↑ Иван Иванович Федюнинский (1961). Поднятые по тревоге (Risen by Agitation). Воениздат, Moscow. 1 2 3 4 David M. Glantz (2002). The Battle for Leningrad: 1941–1944. Lawrence: University Press of Kansas. ISBN 0-7006-1208-4. ↑ L. Lentsman (1977). Eesti rahvas Suures Isamaasõjas (Estonian People in Great Patriotic War) (in Estonian). Tallinn: Eesti Raamat. 1 2 Wilhelm Tieke (2001). Tragedy of the faithful: a history of the III. (germanisches) SS-Panzer-Korps. Winnipeg: J.J.Fedorowicz. 1 2 3 4 Estonian State Commission on Examination of Policies of Repression (2005). "Human Losses". The White Book: Losses inflicted on the Estonian nation by occupation regimes. 1940–1991 (PDF). Estonian Encyclopedia Publishers. p. 32. ↑ Lauri Mälksoo (2006). "The Government of Otto Tief and Attempt to Restore the Independence of Estonia in 1944: A Legal Appraisal.". Toomas Hiio, Meelis Maripuu, Indrek Paavle (Eds.). Estonia 1940–1945: Reports of the Estonian International Commission for the Investigation of Crimes Against Humanity. Tallinn. pp. 1095–1106. 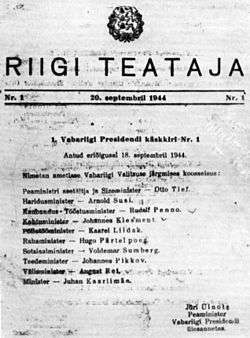 ↑ "Year 1944 in Estonian History". Estonian Ministry of Foreign Affairs. Archived from the original on 14 April 2009. ↑ Lande, D. A. (2000). Resistance! : Occupied Europe and Its Defiance of Hitler. MBI. p. 200. ISBN 978-0-7603-0745-8. ↑ "20. Waffen-Grenadier-Division der SS (estnische Nr. 1)". Axis History Factbook. ↑ Toomas Hiio & Peeter Kaasik (2006). "Estonian units in the Waffen-SS". In Toomas Hiio; Meelis Maripuu & Indrek Paavle. Estonia 1940–1945: Reports of the Estonian International Commission for the Investigation of Crimes Against Humanity. Tallinn. pp. 927–968. 1 2 3 Steven H. Newton (1995). Retreat from Leningrad: Army Group North, 1944/1945. Atglen, Philadelphia: Schiffer Books. ISBN 0-88740-806-0. ↑ Otto Carius (2004). Tigers in the Mud: The Combat Career of German Panzer Commander Otto Carius. Stackpole Books. ISBN 0-8117-2911-7. ↑ R. Landwehr (1981). Narva 1944. Bibliophile Legion Books, Silver Spring. 1 2 3 Arvo L. Vercamer. "Naval War in the Baltic Sea 1941–1945". feldgrau.com. McTaggart, Pat (2003). "The Battle of Narva, 1944". Hitler's Army. Da Capo Press. pp. 287–308. ISBN 0-306-81260-6. Carlos, Jurado; Nigel Thomas; Darko Pavlovic (2002). Germany's Eastern Front Allies (2). Osprey Publishing. ISBN 978-1-84176-193-0. Walter, Hannes. "Estonia in World War II". Historical Text Archive. Retrieved 21 October 2008.